2018 marks 100th anniversary of the Universal Suffrage Act, when (some) women finally gained the right to vote. To celebrate this anniversary writers and artists in schools across Hampshire were asked by the ‘Hampshire Heritage Trust’ to uncover and acknowledge female workers, scientists, sports women, writers and pioneers locally and nationally who have made a difference or brought change at a national or local level, these women did not have to be famous. 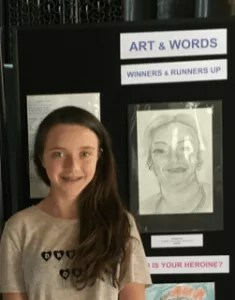 Sam Watson writing about Grace Darling, Rio Gawne-Cain’s poem about Miss Kirk and Annabel Rist’s painting of Margaret Thatcher were also chosen to be displayed.